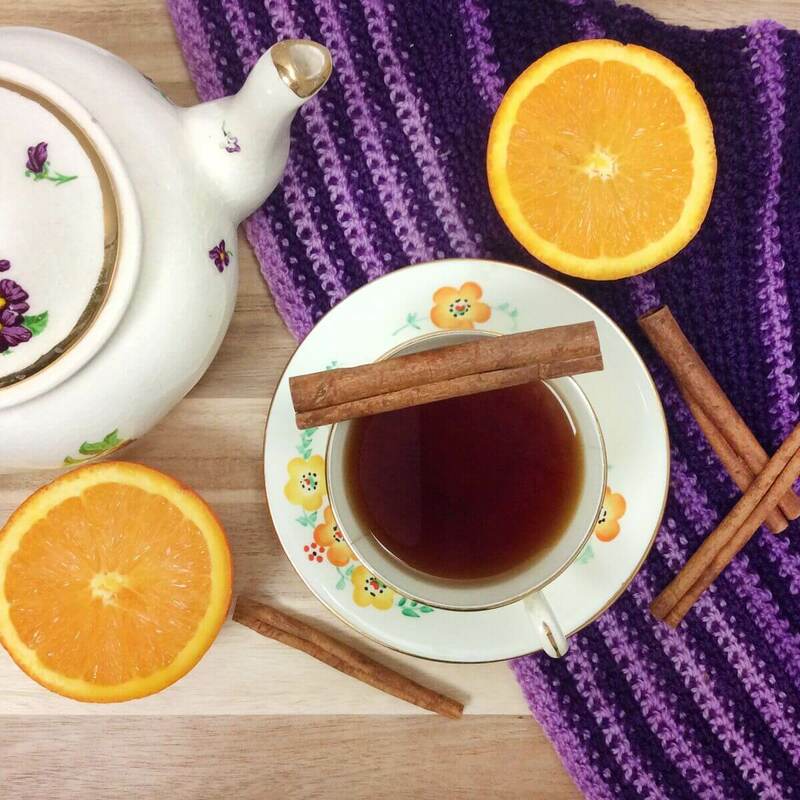 Everybody loves a good cup of orange cinnamon tea — and here at Plum Deluxe, we have our own simple recipe that we make whenever the moment calls for a classic hot or iced tea – it’s widely considered the best orange spice tea out there. We start with a fresh Ceylon black tea that has a wonderful vanilla aroma to it, and add dried orange peel, the best cinnamon chips we can find, and just a pinch of clove and ginger. With a little extra orange extract for added citrus, it’s got a gentle balance that will leave you feeling tranquil and revitalized. 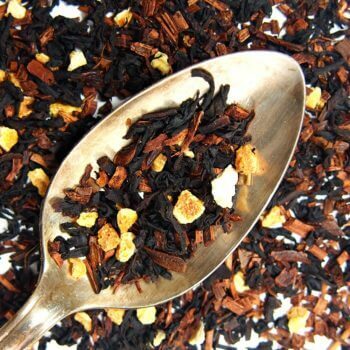 This blend is also available with decaf black tea instead of caffeinated. i love comfort blend. it's exactly its name. very comforting drink. i highly recommend this tea. If these are the flavors you enjoy this will be your new favorite tea. Definitely my go to tea! I don't drink coffee but I still need my "caffeine fix" in the morning. 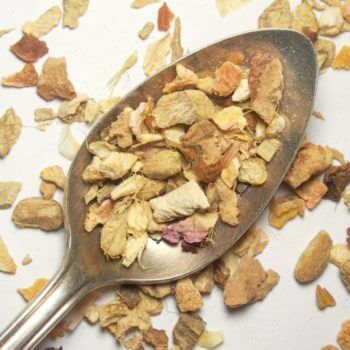 This tea, with it's expertly crafted citrus and spice blend, provides just the boost I need. It's in my regular rotation. I found Plum Deluxe when I was searching for a Black Orange Spice tea because Meijer’s had stopped caring their brand. I can truthfully say I had not had a good cup of tea until I found Plum Deluxe’s Black Orange Spice tea. This is a wonderful blend, but I was hoping for a stronger citrus presence. All I noticed was the cinnamon - which isn’t overpowering, but not what I wanted. 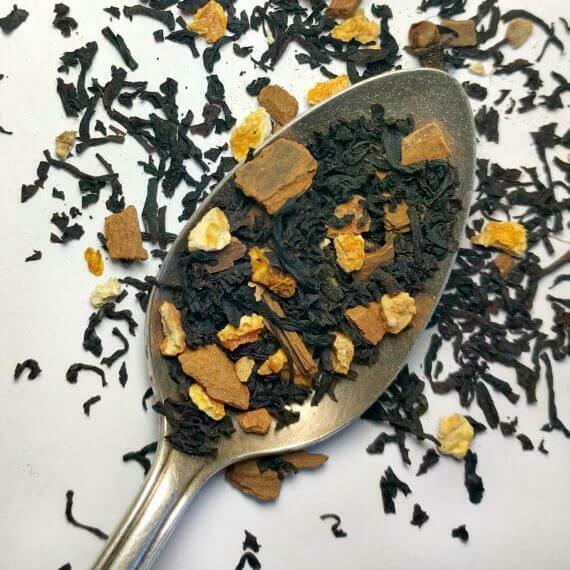 Ingredients: Black Tea, Cinnamon Chips, Orange Peel, Ginger, Clove, Orange Extract, Love, Gratitude. Has Caffeine. Preparation Instructions: Use 1 1/2 tsp per 16oz cup. Steep with boiling water for 3-6 minutes. 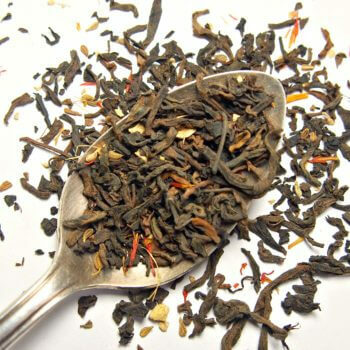 Because we use the freshest ingredients, you can steep your tea twice for a second cup. Suggested Uses: Enjoy this tea with a bit of honey and a snuggly blanket, or stir up a hot toddy on days that call for a little medicine. Great iced in the summer, too! Love this tea? Put it on auto-reorder and Save 15% plus FREE shipping. 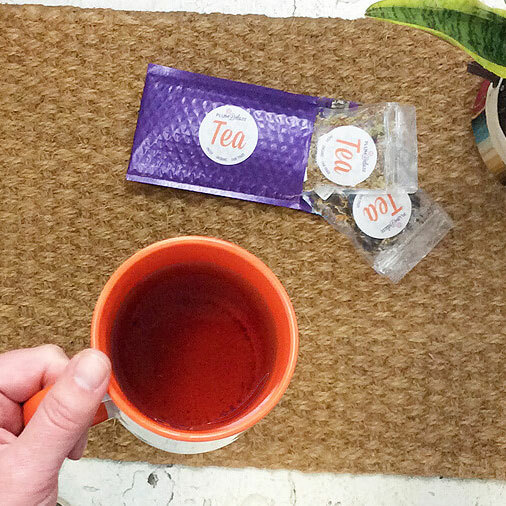 It's not just interesting tea names and delightful flavors that make Plum Deluxe teas special. ✓ Hand-blended in small batches to ensure fresh flavor & dazzling aroma. ✓ Organic, fair trade ingredients from sources we know and trust. ✓ Expertly-tested, carefully curated blends that not only look beautiful but taste great. No hidden sugars or sweetners. Non GMO, no corn, no soy, no gluten, no dairy. It's not just tea, but community. 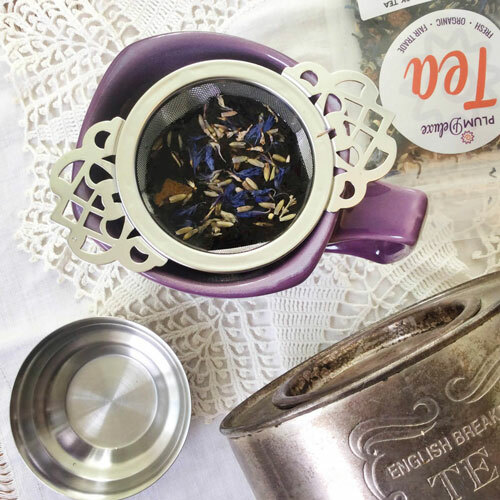 Plum Deluxe customers not only enjoy delicious tea but have found pen pals, best friends, and joyful conversation + connection as members of our tea lover's community - which you become a part of (for free!) when you purchase our teas. 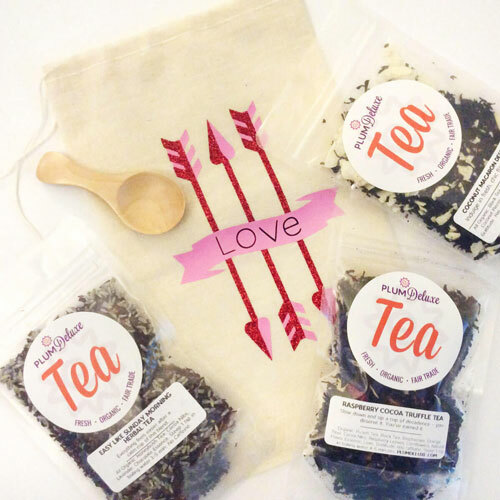 Ordering Information: Once you complete your purchase, your hand-blended teas will be packed into 1 oz resealable pouches. Teas generally leave our workshop via USPS First Class Mail from Portland, Oregon within 2 business days of ordering - we will contact you if we expect any delays. We include a bonus sample in every order for free so you can try something else from our shop! Refund Policy: Due to the exacting and very personal nature of our specialty blends, we cannot offer refunds or exchanges on the tea that we sell. If you find that you get a shipment that is not, well, your cup of tea, we ask that you pass it along to a friend who will enjoy it. Then share your feedback with us so we can continue to improve our product. If there is an issue with your order, please contact us right away so we can make it right. Allergy Information: Plum Deluxe teas are hand-blended in a single facility that also processes tree nuts. Please refrain from purchasing "surprise" teas or samplers if you have food allergies. 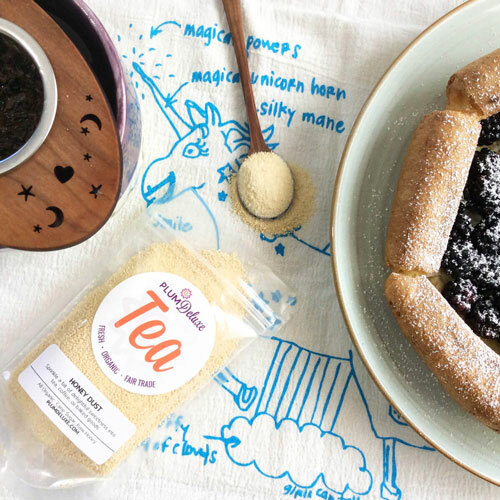 Our Product Sourcing Policy: Almost all of the ingredients purchased by Plum Deluxe for our teas are backed by USDA-compliant organic certifications. In cases where we work with a non-certified vendor, we are purchasing ingredients that are carefully wildcrafted, ingredients that are from a region of the world that does not have an organic certification program (such as parts of Japan or Taiwan), or from small family farms that cannot yet afford their certification or have not yet completed their certification. In all cases, we very carefully vet our products to ensure their are full of flavor, without any unwanted chemicals, artificial flavors, or genetically modified organisms. Thank you for trusting us to find the freshest, most delicious ingredients that are grown on sustainable, fair trade farms by companies we know, like, and trust. About Us: Plum Deluxe is not just a tea company, we are a community on a mission to create moments that matter. Learn more about us here (and about our name - no, we do not put plums in all of our teas).